As a young female law student completing her PhD, Beth Bilson’s academic prowess and leadership skills stood out. Earmarked for success, Bilson was recruited for a faculty position in the law school by a former college leader. "Initially I said I wasn't really interested as I wanted to finish my dissertation," said Bilson, who was completing her doctoral degree in England. "But the dean at the time, Don Clark, came over to London and convinced me that it would be possible to complete it and start teaching at the same time." Bilson rose to the challenge and joined the faculty at the University of Saskatchewan College of Law in 1979. Over the next 20 years, she worked her way up through the ranks and was appointed the first female dean of law at the U of S in 1999. The inaugural appointment is one in a series of firsts for the trailblazer. These include becoming the first female assistant dean of law at the U of S from 1988 to 1992; the first female chair of the Saskatchewan Labour Relations Board from 1992 to 1997; and the first female acting dean twice, first from 2010 to 2011, and again from 2014 to present. In addition, Bilson is one of only two deans to hold the title of dean three times since the inception of the law school in 1912. She shares this accomplishment with former dean and Order of Canada recipient Dan Ish. At the time of her appointment to dean, there were only two other female deans at the helm at the U of S—V. Lynne Pearson, the first female dean of the Edwards School of Business (formerly the College of Commerce) and Yvonne Brown, dean of the College of Nursing. Today, eight of 13 deans at the U of S are women. This majority female ratio also holds true among faculty members at the law school. "We are one of a few colleges on campus to have a majority of women faculty members today," said Bilson, adding that law schools have generally been ahead of the profession in identifying ways to accommodate the needs of female students and faculty members, and incorporating their perspectives in the curriculum and in decision making. "But that's not to say that there were not challenges associated with the participation of women in law school." In the mid-1970s, when Bilson was a law student, only 30 per cent of law students were women. "And this was a considerable jump from even just a few years before that," she said, noting that it was indicative of a pattern across the country at the time. Despite the increased numbers of women participating in legal education, accommodations did not exist for women law students or faculty members with families. "For example, there was no part-time program available. Classes were simply scheduled, and you either chose to go or not go." When Bilson joined the faculty at the law school, she was the third female faculty member in the college. "This was a significant jump, considering there was only one female faculty member in a term position when I was in law school." Several of Bilson's male colleagues on faculty also wanted to see an increase in the participation of women in the legal profession and in legal education. Despite the progress the law school made in diversifying its student body, faculty and curriculum over the years, Bilson said, "tension around claims that woman and other disadvantaged groups were making for greater participation still existed in the late 1990s and 2000s. "There was certainly still some of that tension in the college and the university when I became dean," she said, referring to her first appointment in 1999. "It took the form of obliviousness towards issues women faced such as female participation in higher education, security on campus, family issues and others. These issues tended to not be given priority on the agenda." On the other hand, a significant increase in the number of appointments of women to senior leadership positions was taking place. "It continues to be very important that women occupy senior academic and administrative positions at universities, as it sends a signal that their contribution is valued, and that they are seen as somebody who can play a leadership role in a high-profile way." In order to ensure qualified female applicants are available for leadership roles, it is imperative that female participation in higher education, in particular PhD programs and faculty positions, be supported. "This is of particular concern as the PhD programs are the pool from which faculty members are often recruited," she said. When asked how to ensure increased participation by women, Bilson reflected on the encouragement she received while completing her doctoral work, and recommended a similar approach. "You have to start recommending them for administrative responsibility early in their careers, and encouraging them to be interested in administrative work." Judging from Bilson's unparalleled series of firsts, this approach works. 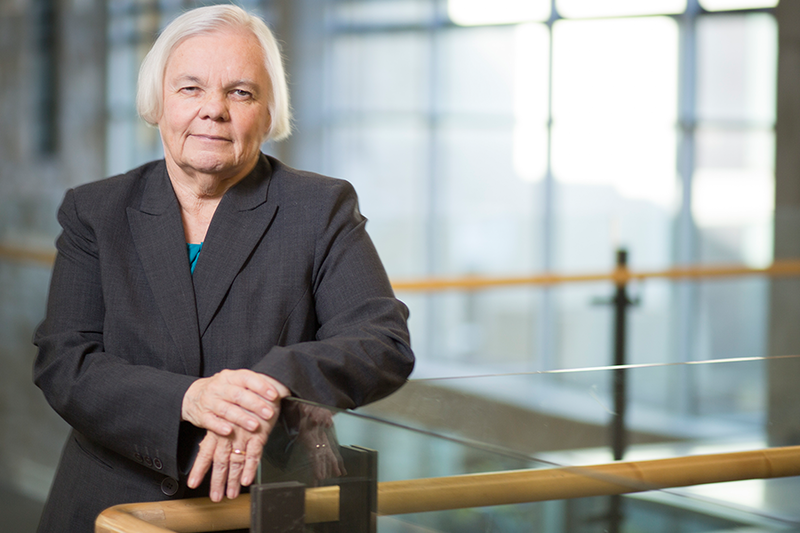 Among her numerous significant achievements as dean, two stand out according to Bilson: the College of Law's first strategic plan and the Indigenous Peoples and Justice Initiative proposal, a joint proposal with sociology and political studies. Bilson noted that the college's first strategic plan was the result of "the first round of strategic planning for the university, and as such, a challenging process." The final strategic plan was well articulated and an important first step for the college. She also considers her work with alumni the most gratifying part of her job. "In a teaching profession you spend a lot of time with students and then they leave. It's often hard to know whether you're having a positive effect on them or not. So reconnecting and finding out how they are doing is always interesting." In a career spanning 37 years, it can be safely said that Bilson is a pioneer produced by the institution. Through her successes in leading the college and teaching, her professionalism, her grace and humility, Bilson has earned the respect of colleagues and students alike. Ernie Barber, interim provost and vice-president academic for the University of Saskatchewan, is among these colleagues. "In October 2014, I had no hesitation calling Beth to service as interim dean of the college of law, and it won't surprise anyone who knows her that she had no hesitation accepting the call: The terms and conditions of the appointment could and would wait, none of that being as important to her as getting to work and ensuring continuity of leadership in the college," he said. He also acknowledged that Bilson has been appointed to senior leadership roles repeatedly throughout her career. "Beth Bilson is a servant leader, totally committed to students, the college of law and the University of Saskatchewan. She has been entrusted over and over again to represent the University on numerous internal and external assignments, such as academic program prioritization and representation on the Wanuskewin Board—wherever there is a need for thoughtful and thorough analysis, good judgement, and collaborative decision making." While she has yet to find time to "make a retirement plan" and her contribution is far from over, the College of Law is in a better place than when she arrived. Debora Senger is a communications and alumni relations officer in the College of Law.